Salon Bronze sunless airbrush tanning system gives you an even, natural looking, deep tan that can be applied virtually anywhere without exposing yourself to harmful UV rays. 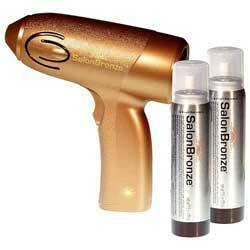 Salon Bronze "Easy 360" applicator airbrush allows even application from any angle with no unnatural streaking. Salon Bronze dries in seconds and color looks natural on any shade of skin. One application lasts seven to ten days. Salon Bronze is safe, easy, and its aloe vera and white tea extracts leave skin smooth and moisturized.